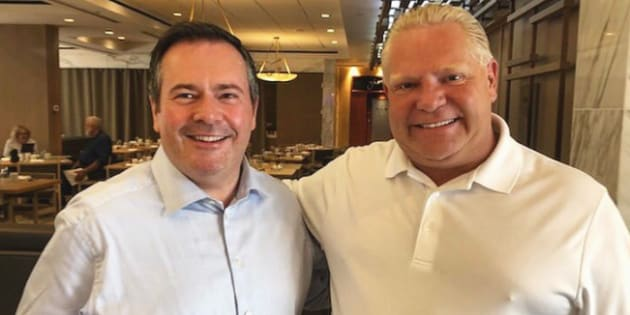 United Conservative Party Leader Jason Kenney and Ontario Premier Doug Ford are shown in a photo posted to Twitter. Provincial Conservative leaders in Ontario and Alberta are taking the next step in their budding bromance: a joint rally to bash carbon pricing and, likely, Prime Minister Justin Trudeau. Jason Kenney, leader of Alberta's United Conservative Party, announced on Twitter Thursday that Ontario Premier Doug Ford will attend a "Scrap The Carbon Tax Rally" in Calgary on Oct. 5. In a tweet of his own, Ford lauded Kenney for working "tirelessly to fight the federal carbon tax." "I am proud to say that Ontario will stand with Albertans who oppose this unfair and burdensome tax on families and businesses," the premier wrote. The federal government is demanding that all provinces and territories put a price on carbon emissions — either with a cap-and-trade program or carbon tax — that will start at $10 per tonne in 2019 and rise to $50 a tone by 2022. Those jurisdictions without a suitable plan will have a carbon tax imposed on them, with the feds promising to return revenue directly to residents. In one of his first acts as premier this summer, Ford dismantled Ontario's cap-and-trade program. His government also launched a constitutional challenge against the federal plan and joined an earlier legal fight started by the Saskatchewan government. Prime Minister Justin Trudeau and Doug Ford meet at the Ontario Legislature in Toronto on July 5, 2018. Alberta already has a carbon tax of $30 per tonne under NDP Premier Rachel Notley. In August, Notley announced the province will abandon Trudeau's carbon plan after the Federal Court of Appeal quashed the approval of the Trans Mountain pipeline expansion. The move means the province price will not jump to $50 in 2022. Kenney has pledged to repeal the tax entirely if the UCP wins a provincial election next spring. A former senior federal Conservative minister, Kenney has also shown a fondness for taking shots at Trudeau. In May, he apologized for telling a journalist that the prime minister had the "political depth of a finger bowl." On the campaign trail this spring, Ford frequently revved up crowds by claiming the prime minister had his hand in their pockets. In addition to carbon pricing, Ford's government has also clashed with the feds on asylum seekers. In a speech last month to federal Conservatives at the party's policy convention in Halifax, N.S., Kenney touted Saskatchewan Premier Scott Moe's leadership on a "fight" with Ottawa over the issue. "And I am so excited that we have been joined by Canada's newest premier Doug Ford," he said. "Doug and I had breakfast yesterday and I'll tell you we've got the beginning of a bit of bromance there. "We were finishing each other's sentences. I love it. Common senses has come back to Queen's Park." Kenney added the he can't wait to sit down at the "premier's table" with Moe and Ford to "fight the Trudeau carbon tax together." In his keynote address to Tory delegates that weekend, Ford sparked a standing ovation when he pledged that "Ontario will stand with like-minded provinces and with all of you to fight Justin Trudeau and his carbon tax with every tool at our disposal." Ford told the crowd that he was confident Kenney will become Alberta's premier and help him take the issue "beyond the courts and to the people." "We will not given an inch," Ford said at the time. "Not a single inch."